Personalized memo holder gift, shipped fast! This is a must have for the busy person - personalized to capture their passion. 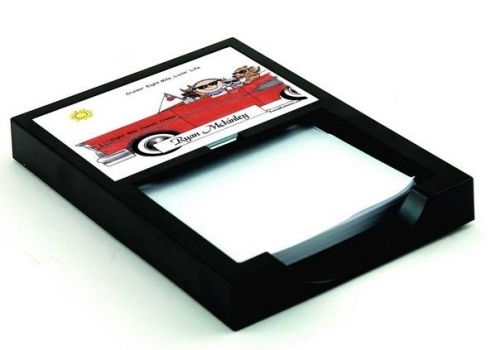 Personalized memo holder gives you the best of both worlds - a practical memo holder along with your adorning personalized Friendly Folks cartoon caricature. The ideal gift for everyone, even if they're hard to buy for or you're shopping at the last minute. Our memo holder measures approximately 5-1/4" x 7-1/4", with your Friendly Folks cartoon inset atop, measuring 4-1/2" x 2-13/16". It comes complete with 100 sheets of standard 4" x 6" note paper. Refills are available at PrintedPerfection.com or any office supply. Base of memo holder is complete with non-slip rubber feet.